Lizards are part of a group of squamate reptiles. Squamate reptiles are distinguished by their skins, which bear horny scales or shields. Lizards, part of the Lacertilia suborder, is defined as all extant members of the Lepidosauria (reptiles with overlapping scales), which are neither sphenodonts (i.e., tuatara) nor snakes. Because of this, the lizard group form an evolutionary grade. Sphenodonts are the sister group to the Squamates, the larger monophyletic group, which includes both the lizards and the snakes. An evolutionary grade is defined as a group of species united by traits that are either morphological or physiological, that has given rise to another group that differs markedly from the ancestral condition, and is not considered part of that ancestral group. These reptiles typically have feet and external ears. Snakes do not have these features. Since lizards are excluded from the snake family, the group does not have any unique distinguishing characteristic as a group. Lizards and snakes share a movable quadrate bone, distinguishing them from the sphenodonts, which have a more primitive and solid diapsid skull. Most lizards can detach their tails to escape from predators, an act called autotomy. Vision, including color vision, is particularly well developed in most lizards, and most communicate with body language or bright colors on their bodies as well as with pheromones. In a single new scientific publication, 24 new species of lizards known as skinks, all from islands in the Caribbean, have been discovered and scientifically named. According to Blair Hedges, a professor of biology at Penn State University and the leader of the research team, half of the newly added skink species already may be extinct or close to extinction, and all of the others on the Caribbean islands are threatened with extinction. The researchers found that the loss of many skink species can be attributed primarily to predation by the mongoose -- an invasive predatory mammal that was introduced by farmers to control rats in sugarcane fields during the late nineteenth century. 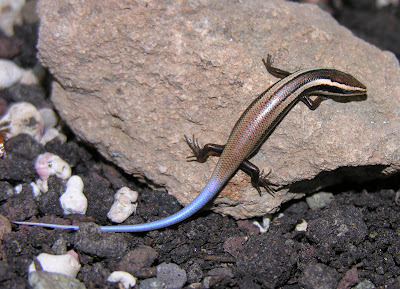 The research team reports on the newly discovered skinks in a 245-page article to be published on 30 April 2012 in the journal Zootaxa. About 130 species of reptiles from all over the world are added to the global species count each year in dozens of scientific articles. However, not since the 1800s have more than 20 reptile species been added at one time. Primarily through examination of museum specimens, the team identified a total of 39 species of skinks from the Caribbean islands, including 6 species currently recognized, and another 9 named long ago but considered invalid until now. Hedges and his team also used DNA sequences, but most of the taxonomic information, such as counts and shapes of scales, came from examination of the animals themselves. "Now, one of the smallest groups of lizards in this region of the world has become one of the largest groups," Hedges said. "We were completely surprised to find what amounts to a new fauna, with co-occurring species and different ecological types." He added that some of the new species are 6 times larger in body size than other species in the new fauna. Hedges also explained that these New World skinks, which arrived in the Americas about 18 million years ago from Africa by floating on mats of vegetation, are unique among lizards in that they produce a human-like placenta, which is an organ that directly connects the growing offspring to the maternal tissues that provide nutrients. "While there are other lizards that give live birth, only a fraction of the lizards known as skinks make a placenta and gestate offspring for up to one year," Hedges said. He also speculated that the lengthy gestational period may have given predators a competitive edge over skinks, since pregnant females are slower and more vulnerable. "The mongoose is the predator we believe is responsible for many of the species' close-to-extinction status in the Caribbean," Hedges said. "Our data show that the mongoose, which was introduced from India in 1872 and spread around the islands over the next three decades, has nearly exterminated this entire reptile fauna, which had gone largely unnoticed by scientists and conservationists until now." According to Hedges, the "smoking gun" is a graph included in the scientific paper showing a sharp decline in skink populations that occurred soon after the introduction of the mongoose. Hedges explained that the mongoose originally was brought to the New World to control rats, which had become pests in the sugarcane fields in Cuba, Hispaniola, Puerto Rico, Jamaica, and the Lesser Antilles. While this strategy did help to control infestations of some pests; for example, the Norway rat, it also had the unintended consequence of reducing almost all skink populations. "By 1900, less than 50 percent of those mongoose islands still had their skinks, and the loss has continued to this day," Hedges said. This newly discovered skink fauna will increase dramatically the number of reptiles categorized as "critically endangered" by the International Union for Conservation of Nature in their "Red List of Threatened Species," which is recognized as the most comprehensive database evaluating the endangerment status of various plant and animal species. "According to our research, all of the skink species found only on Caribbean islands are threatened," Hedges said. "That is, they should be classified in the Red List as either vulnerable, endangered, or critically endangered. Finding that all species in a fauna are threatened is unusual, because only 24 percent of the 3,336 reptile species listed in the Red List have been classified as threatened with extinction. Most of the 9,596 named reptile species have yet to be classified in the Red List." Hedges explained that there are two reasons why such a large number of species went unnoticed for so many years, in a region frequented by scientists and tourists. "First, Caribbean skinks already had nearly disappeared by the start of the twentieth century, so people since that time rarely have encountered them and therefore have been less likely to study them," he said. "Second, the key characteristics that distinguish this great diversity of species have been overlooked until now." Hedges also noted that many potential new species of animals around the world have been identified in recent years with DNA data. However, much more difficult is the task of following up DNA research with the work required to name new species and to formally recognize them as valid, as this team did with Caribbean skinks. The other member of the research team, Caitlin Conn, now a researcher at the University of Georgia and formerly a biology major in Penn State's Eberly College of Science and a student in Penn State's Schreyer Honors College at the time of the research, added that researchers might be able to use the new data to plan conservation efforts, to study the geographic overlap of similar species, and to study in more detail the skinks' adaptation to different ecological habitats or niches. The research team also stressed that, while the mongoose introduction by humans now has been linked to these reptile declines and extinctions, other types of human activity, especially the removal of forests, are to blame for the loss of other species in the Caribbean. PHOTOS: Twenty-four new species of lizards known as skinks have been discovered on Caribbean islands by a team led by Blair Hedges, of Penn State University, who has described the species scientifically. Half of these new species already may be extinct or close to extinction. The loss of many skink species can be attributed primarily to predation by the mongoose -- a predatory mammal that was introduced by farmers. Other types of human activity, especially the removal of forests, also are to blame, according to the researchers. Studying Coral Reefs, Global Warming and Coral Bleaching. Can Corals Adapt?